The Naval Aircraft Factory PN was a series of American flying boats of the 1920s and 1930s. 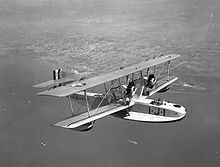 A development of the Felixstowe F5L flying boat of the First World War, variants of the PN were built for the United States Navy by Douglas, Keystone Aircraft and Martin. The chief long-range patrol flying boats of the United States Navy at the end of the First World War were the Curtiss H.16 and the similar Felixstowe F5L. The F5L was a license-built version of the British Felixstowe F.5 using the American Liberty engine. The series of Felixstowe flying boats, developed by the Seaplane Experimental Station, had started with improving the hull of the Curtiss H12. 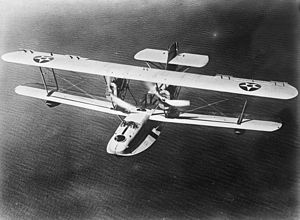 The Naval Aircraft Factory, which had built F.5Ls during World War I, continued development of the design, which was re-designated PN-5 in 1922 (although in practice continued to be known as F.5Ls), with the final two being built to an improved design, the F-6L (later designated PN-6). In 1925, the Naval Aircraft Factory produced a version with new wings with an airfoil section of greater maximum lift coefficient. It was powered by experimental 525 hp Wright T-2 piston engines, and was designated PN-7. Although the new wing proved successful, the engines were unreliable, and the wooden hull inherited from the F.5 required much maintenance, so two aircraft with metal hull construction and powered by 475 hp Packard engines were built as the PN-8. Further, similar aircraft were built as the PN-9 and PN-10, but the water-cooled V-12 Packard engines were disappointing and radial engines were substituted to produce the PN-12. This combination of the revised wings introduced by the PN-7, with a metal hull and radial engines met the requirements of the Navy and therefore the PN-12 formed the basis of more extensive production to re-equip its patrol squadrons. As the production capacity of the Naval Aircraft Factory was limited, production was contracted out to several aircraft companies, with versions being built by Douglas (PD-1), Keystone Aircraft (PK-1) and Martin (PM-1 and PM-2). The PN-12 was a twin engined biplane with fabric-covered metal-framed wings, and its engines mounted in nacelles between the wings. While the hull was constructed of metal, it was otherwise similar to that of the F.5L, with the large sponsons that were a feature of both that aircraft and the Felixstowe and Curtiss flying boats to which it could trace its heritage. It had a standard crew of five, but was capable of carrying a relief crew for long patrols. The PN-11 featured a revised hull which eliminated the sponsons. It also used twin vertical tails. Four of this variant were built. They were the basis of the Hall PH flying boats, some of which remained in service until World War II. The early prototypes were used for a series of long-distance flights, with an attempt being made on 1 September, 1925 by the PN-9 to carry out a non-stop flight from San Francisco to Hawaii, a distance of 2,400 miles (3864 km). The aircraft ran out of fuel after 1,841 miles, a new distance record for seaplanes, but still 200 miles short of the nearest landfall. The crew then rigged crude sails made from fabric torn from the aircraft's wings and sailed the aircraft a further 450 miles to reach the Hawaiian island of Kauai on 10 September. The same aircraft was lost during an attempted long distance flight to South America, being sunk as a navigation hazard after ditching in the Caribbean Sea. The two PN-12s were also used to set various records, including range and speed over circuit records. The various production derivatives of the PN-12 entered service with the US Navy from 30 April, 1928, when VP-7D received its first Douglas PD-1, remaining in service until July 1938, when the last Keystone PK-1 was retired. Three Martin PM-1s were also supplied to the Brazilian Navy in 1930. PN-6 Redesignated F-6L. Last two Naval Aircraft Factory F5Ls, modified with revised tail surfaces. PN-7 Modified version with new wings with high lift thick aerofoil section and reduced wingspan (72 ft 10 in compared with 103 ft 9 in). Powered by two 525 hp Wright T-2 engines. PN-9 Converted from PN-8 with redesigned engine nacelles. One converted. PN-10 Similar to PN-8. Powered by two 500hp Packard 1A-2500. Two built. PN-11 New hull eliminating sponsons. Four built, one with two Pratt and Whitney R-1690 Hornet engines, and remaining three powered by two Wright R-1750 D Cyclone. Last three later re-designated XP4N. XPN-11 One prototype, fitted with twin vertical tail surfaces. PN-12 Development of PN-10 powered by radial engines. Two built. One powered by two Pratt and Whitney Hornet engines, with the other powered by two Wright R-1750 Cyclone engines. Douglas PD-1 Developed production version of PN-12. Two 575 hp Wright R-1750 Cyclone engines. 25 built by Douglas. Keystone PK-1 Production version of PN-12. Twin tails. Two 575 hp Wright R-1820 Cyclone engines. 18 built by Keystone. Martin PM-1 Production derivative of PN-12. Two 525 hp Wright R-1750 Cyclone engines. 27 built for US Navy by Martin. Martin PM-1B Export version of PM-1 for Brazil. Three built. Martin PM-2 Improved derivative of PM-1 with more powerful Wright R-1820 Cyclone engines and twin tails. 25 built. Swanborough, Gordon; Bowers, Peter M. (1976). United States Navy Aircraft since 1911 (Second edition ed.). London: Putnam. ISBN 0 370 10054 9. Naval Aircraft Factory PN Pictures and Naval Aircraft Factory PN for Sale.